At several conferences I’ve used the image above to illustrate how a blog can be the centerpiece to a social SEO effort where objectives are focused on raising brand awareness and improving customer relationships in a way that is beneficial to search engine visibility. 1. Social media involvement produces content. Content that is optimized and linked to, does well in search engines like Google, Yahoo and Bing. Therefore, optimized social content and the digital assets that are common to social media (images, video, audio and widgets) are all optimization opportunities. Better search engine visibility means more traffic to social media content from customers that are looking for it. 2. Of the top 20 search engines according to comScore qSearch in August 2009, 3 are search functions within social media web sites. YouTube is the second most popular search engine after Google. MySpace and Facebook are also in the top 20. In fact, Facebook’s percentage of increase from July to August was more than double any other search engine in the top 20. The increasing popularity of search within social networks presents optimization and analytics opportunities. Marketers need to realize search doesn’t just happen on Google, Yahoo and Bing. Twitter is many things, including social network, messaging platform and search engine. 3. While great content is instrumental for great performance within organic search results, publishing in a vacuum is naive. Creating distribution channels for great content can drive awareness, traffic and inbound links. Optimized content with a quantity of quality incoming links results in superior search visibility. Social networks and media sites that have social networking functionality offer prime opportunities to interact with communities of interest and can be particularly effective as distribution channels. If there were ever a legitimate way to automate link building, it would be the RSS disribution and syndication functionality to promote new content to people who are interested. Those same people are often publishers in the form of blogging, reviews, comments and new features like Google SideWiki with the ability to link out to what they’re interested in. The diagram above illustrates this situation well, where a blog is the central repository of content and social media sites around it are the developed networks of communities and channels of distribution for quality, keyword optimized content. What other opportunities do you see with Social Media SEO? I’ll be presenting on this topic today at 9:45 during the MIMA Summit, Salon C. If you’re attending the sold out event, I hope to see you there. If not, check out the live video stream on the MIMA Summit web site. We’ll also be liveblogging the event here, so watch for more posts later this morning and afternoon. as always… excellent post Lee! I had never thought or realized that the search engine at Youtube was that heavily used. It is the second most heavily used on my computer also. Thanks Steve, the session went really well. Excellent post and image to illustrate your point. It is clear that as each day passes, people are spending more time in social media networks (youtube, facebook, twitter) and thus using those sites to search for content. Thanks! This was an informative article. It’s important to take the TIME to build quality links on an ongoing and frequent basis; and it will take TIME (like you said) for this work to show results. Good relation between Coke and blogging. Love the visual diagram! Didn't realize Youtube was that popular a search engine. Thanks for such a useful information. I was unaware about the advantages of the Search engine optimization. there are many ways to optimize your blogs. All these are very true. Thank you for giving your readers a valuable and useful resources. Using excessive social media channels can lead up to echos. Like fore example, if your blog post, auto-posts to twitter and friendfeed, and your friendfeed in turn auto-posts to twitter and facebook. IMHO moderated use of automatic settings from social websites are advisable. This is also seemed to be an informative and helpful to us. –>If you own a pair of Ugg boots, ugg classic short, be sure to take proper care of them and clean them regularly. With the proper care and cleaning, Uggs can last several years or even a lifetime. You love sheepskin footwear and ugg classic because they are comfortable and fashionable. How to keep them looking great? The following are a few tips to help you to know what you don't do for your natural beauty and functionality uggs. –>Tip one, don't store your cardy boots ugg in a light place. Because they can bleach in extreme sunlight. –>Tip two, ugg boots should not be worn in extremely moist or muddy conditions as moisture can cause problems. –>Tip three, don't clean the exterior of? your uggs knightsbridge with a hard brush or cloth at first time dirty. –>Tip four, trying not to saturate the sheepskin footwear with water, especially warm or hot water. And don't clean them in a washing machine or dryer, this will cause problems with shrinkage and can adversely change the sheepskin. –>Tip five, if need, except specially detergent for sheepskin product, just like classic ugg mini, don't use any wool detergent. Also don't use high concentration cleaning solution. –>Some suggestions for you to protect your natural beauty and functionality uggs long periods of time. And also hoping to help you solving your hesitation, spending little time to know more information about ugg boots. Thanks for these very helpful information… Keep posting! Thanks for such a useful information for my website's like http://www.jewelfortune.com . I was unaware about the advantages of the Search engine optimization……………Keep posting! I think a blog is a solid distribution channel due to its user-generated content thus creating user-generated distribution. This is a great article, and the visual really helps to put the whole concept of promoting through social media in perspective. In terms of distribution and visibility, content needs to reach a critical mass. What this level is varies for all enterprises. Marketing effort do tend to overlap sometimes, i.e. the Twitter, Facebook, LinkedIn crowd. The big G tends to devalue anything they don't own, go figure, hence Youtube ranking #2. Pittsburgh Internet Marketing firms such as Blackball Online Marketing use these channels fairly well. We are seeing Social Media hit a critical mass of its own. It is a wonderful time to be in this business. Thanks for a great post. This was an informative post. 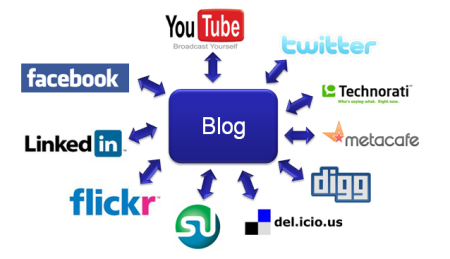 I had never really though of the blog as the center of SEO and SMM. This is a great theory and I will have to try it!